Active Listening Skills: What they didn’t teach you in school could be the key to becoming closer to your friends and family; a better, stronger leader; and finally able to explode your earning potential. Active listening is a skill so important that anyone who lacks it is sure to have problems at home and at work: problems with a spouse, kids, customers, a boss (or bosses), or co-workers. When you don’t know how to listen to others, you can’t help but create misunderstandings that end up costing a lot of time and money. But those trends do not have to continue. 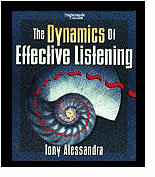 The Dynamics of Effective Listening is an MP3 audio program that will teach you how to effectively listen to others. Dr. Tony Alessandra and his thirty plus years of researching human behavior will help you tap into your own communication power. You can master the skill of active listening in just a few short weeks.